Inside Google Maps, we still live together. It’s July 2012 here; my car is parked in the driveway. One of your ham radio antennae peeks over the roof. The trees are in full leaf, so I can’t see the windows; are the lights on? Am I inside? It’s overcast, but the sun seems high; maybe I’m walking the dog, but I don’t see us. Probably I’m at my desk. Possibly I am on the floor crying for reasons I don’t even understand. It is five months until I leave. You’re at work. Inside Google Maps, it’s July 2008 at your lab. I can’t zoom in close enough to see your bike in the vestibule, but I know you’re there. It’s overcast here too, one mile and four years away; maybe they’re the same clouds. Maybe they never parted. We aren’t married yet, here at the lab, though we will be soon. In truth, inside Google Maps it will never be “now” anywhere. The most trafficked streets of the most traversed cities might be re-sampled every year or two, but even there it is at best this afternoon, this morning, yesterday. More likely it’s last month, last year, two years ago. You can travel back in time, on these popular streets, rolling the clock back to the panoptic camera’s previous run—but you won’t see the time in between. At my first New York apartment, it is 2014, and 2013, and 2011, and 2009, and 2007 . . . but it is never 2012. 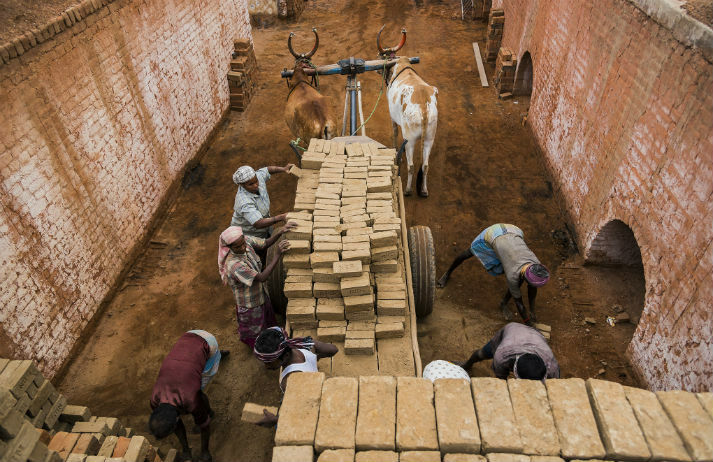 Anti-slavery researchers are using Google Maps to track and disassemble modern slavery operations in India. By using ubiquitous surveillance to defend people’s human rights, the project is working against negative perceptions of the tech industry’s impact on privacy. See also this related article. We’re becoming navigational idiots. The problem isn’t GPS itself. The Global Positioning System, which uses a constellation of satellites to determine one’s location on the globe, is just a way of fixing points on a map. Rather, the problem is how smartphone apps such as Google Maps, Apple Maps, and Waze display our routes. Because these apps seek primarily to direct us efficiently from A to B, their default presentation is a landscape somewhere between minimalist and impoverished—typically a fat colored line (your route) running through a largely featureless void. Mappers call this goal-oriented perspective” egocentric.” It’s all about you. Paper maps, by contrast, use an “allocentric” presentation—one that forces you to plan and frame your route within a meaningful context: towns, forts, universities, parks, and natural features named for local heroes and history (such as Lake Champlain and Smugglers’ Notch in my home state of Vermont), distinctive shapes (Camel’s Hump), or local flora and fauna. (The Winooski River, which flows through my town, gets its name from the Abenaki word for the wild onion that grows on its banks.) Such maps bear a rough but essential resemblance to the mental map locals carry in their heads. …The distinction between these two wayfinding modes interests not just mapmakers, but neuroscientists, for each draws upon a distinctive neural network to understand space and move us through it. Your phone’s default egocentric (or “cue-based”) mode is the domain of the caudate nucleus, a looping, snake-shaped structure that is heavily involved in movement and closely tied to areas of the brain that respond to simple rewards. Navigating by map—often called a cognitive mapping strategy because it builds and draws on the map in your head—primarily uses the hippocampus, an area in the center of the brain crucial to spatial memory, autobiographical memory, and our ability to ponder the future. While most of us favor one or the other of these navigational strategies, both are required; lose either and you’ll soon lose your way. Unlike previous crises, however, refugees aren’t making the journey blind. Smartphones are ubiquitous among the crowds, aid workers say — empowering migrants to make smarter decisions and transforming the way that aid is delivered to them. Where will maps lead the travellers of tomorrow? Imagine a machine that could transport you from one side of the world to the other at the press of a button. One minute, you’re wandering amid the stupas of Borobudur, Java; the next, you’re exploring a grotto in Poland’s Wieliczka Salt Mine; later still, you’re following giant tortoises along a volcanic ridge in the Galapagos Islands. I haven’t been to any of these places. But thanks to that magical machine – not one, come to think of it, but several: on my desk at work, in the study at home, in the pocket of my jeans even – I know they’re all just a moment away. For that, I salute the ever-increasing richness of Street View, the offshoot of Google Maps that allows you to parachute Pegman – the little yellow icon in the corner of the map – into panoramic photos of the real world. For many people, Street View, virtual reality, and whatever technology builds on or supplants them, will provide the impetus for adventure. No question about it. But is it too fanciful to suggest that it might also signal the start of a different trend: the ‘traveller’ who, for reasons ranging from lack of opportunity to outright apathy, explores the world through technology alone.